The Indian community School Kuwait congratulates Dr. V .Binumon, The Principal and Senior Administrator of the school on receiving the prestigious National award for the Best Teacher by the Honorable President of India. It is a matter of great pride and honor for the school as this much coveted and glorious award is received by Dr. V Binumon .The excellent leadership and amiable team spirit of Dr.Binumon endears him to the management and staff alike rendering greater glory to the achievement. The Board of Trustees whole heartedly congratulated and appreciated him on this magnificent achievement. Dr. Binumon received The prestigious National Award for The Best Teacher from the Honorable Vice President on 5th September 2017 in a Solemn function at the Vighyan Bhavan, New Delhi .Sixteen teachers under various categories were carefully selected for the award from the large number of teachers in Various schools across India, Middle East and a number of countries. Dr. V. Binumon was awarded in the CBSE Principal category. The award is well deserved owing to the dedicated efforts of Dr. Binumon in the scenario of curricular and co - curricular activities of the school over the years and his many years of service in the field of education. His proficiency and excellence in various fields has been rendering remarkable service to the Indian Community in Kuwait .He holds various posts, as the appointed CBSE Registered Councilor, Member of CBSE school affiliation Committee, ISO auditor, an experienced personality trainer , hypnotherapist , expert in Neurolinguestic programming , Central superintendent of CBSE exams and NIOS coordinator for Kuwait. His qualifications befits the great honor bestowed on him , equipped with more than twenty years of experience in teaching with seven post graduate degrees including MBA and two M.Phils beside a Doctorate in Education. Dr.Binumon always pursue excellence. His hard work and dedication has lead The ICSK to greater name and fame , the Mega art fest named ISMAF , first of its kind was initiated and conducted successfully under the leadership of Dr.Binumon, the event is one of its kind in Middle East with the participation of more than 3000 students from different schools across Kuwait. IOS, another of the grand ventures at ICSK is a pioneering experience at Kuwait with an intention to provide education to all. This year (2016-17), The President of India's National Teacher award distribution was an excellent event due to the novelty of functions. This is the first time that the teacher award function was held with such grandeur and red carpet welcome. The National awards are usually given away by the President to the various categories but this year The Vice President Mr.Venkaiah Naidu gave the awards. The award function held at Vighyan Bhavan, New Delhi was attended and addressed, besides the Vice President, by Sri Prakash Javedekar, Union Minister for Human Resources, Sri SatyapalSingh and Sri Upendra Kuhvaha (both Ministers of State, HR) and Sri Anil Swaroop the Secretary of Education. During the award ceremony, The Honorable Vice President of India addressed the gathering, congratulated the award winners and further kindled their spirit of service with appropriate words when he encouraged them "Teach to transform, Educate to empower and Learn to lead ". He continued that "it’s not the dress but the address that one make for self that matters. DIKSHA - A National infrastructure for the teachers was launched on the same occasion by the Honorable Vice President. The new initiative is a unique one, which focus on getting maximum advantage for the teachers to excel their services using a nationwide, combined digital infrastructure. The Whole event was not just limited to a single award function but into various stages spanning over a time period of a few days. Sri Prakash Javedeker, Union Minister for Human Resources, hosted a lunch in honor of the awardees a day before the award function. The following afternoon, soon after the award function, The President of India, Sri Ramnath Kovind, gave a red carpet welcome to the awardees at the Rashtrapati Bhavan. 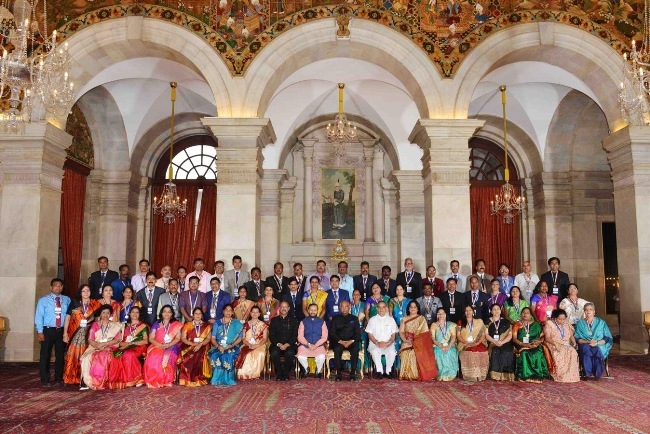 In another function that followed at the Durbar Hall, the President congratulated the award winners and addressed them as the representatives to lakhs of highly committed and effective Indian teachers; National Balbhavan New Delhi staged various cultural programs to add color to the occasion. The First citizen was extremely courteous and hospitable during the m photo session at Ashoka Hall, followed with a high tea arranged for the awardees at the dining hall where the award winners were visited and congratulated by the President .The warm national welcome and grandiose was an experience of a lifetime to all the award winners.